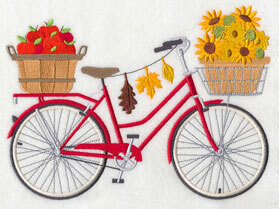 Cycle through the seasons with a parade of pedaling bicycles! 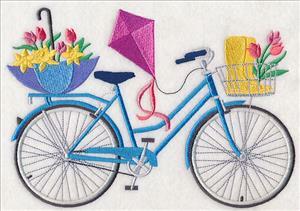 Wish a happy birthday to loved ones with a bike adorned with balloons, or stitch for your crafty connoisseur with a sewing-theme design. 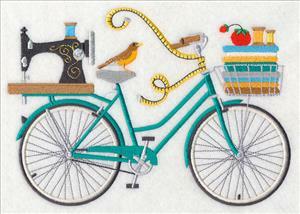 Or, stitch all the bicycles (including wheels for the beach bum, the book lover, holidays, and more) together on a quilt or kitchen towel set! 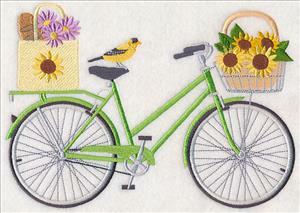 Totes, pillows, wall hangings and more will all get a fresh and fabulous update when embroidered with these stunning wheels. Order yours today. 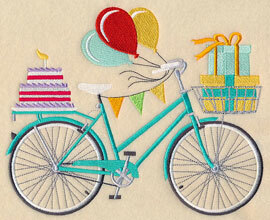 Blow out the candles on your birthday with a bike that's ready to party. 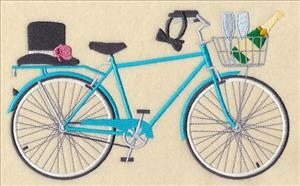 Or, stitch for your sewing or crafts room with a bicycle that's full to the brim with all your crafty notions. 8.42" x 6.86" and 7.78" x 6.33"
8.45" x 6.00" and 7.78" x 5.52"
7.00" x 4.97" and 5.97" x 4.25"
Any vino-enthusiast will love sipping on the vintage toted by this wine bicycle. 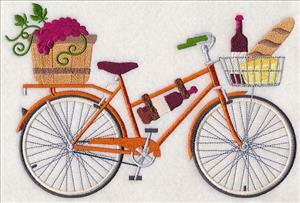 Great for wine bags, kitchen towels, and more! 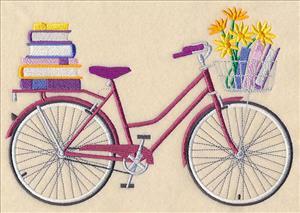 Or, adorn a backpack or tote bag with a book lover's bike. 8.45" x 5.71" and 7.78" x 5.26"
8.45" x 5.87" and 7.78" x 5.41"
6.90" x 4.80" and 5.98" x 4.16"
Any bride or groom will love getting a set of towels, quilt, or pillows with these wedding wheels. 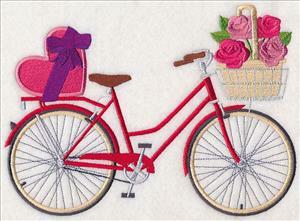 Also terrific for anniversary or bridal shower gifts, too! 8.40" x 5.57" and 7.74" x 5.13"
8.40" x 5.09" and 7.74" x 4.69"
6.91" x 4.18" and 5.94" x 3.60"
Wrap up for winter with a two-wheeler toting ice skates, a scarf and mittens, and winter blooms. 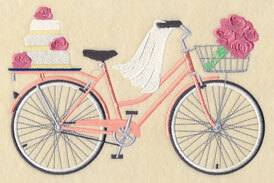 Or, stitch a pillow or framed piece for your sweetheart with a romantic design featuring roses and a box of chocolates. 8.50" x 6.03" and 7.83" x 5.56"
8.45" x 6.17" and 7.78" x 5.68"
7.00" x 5.11" and 5.97" x 4.36"
Stitch the luck o' the Irish with a cycle decorated with shamrocks, Irish wildflowers, and a pot of gold. 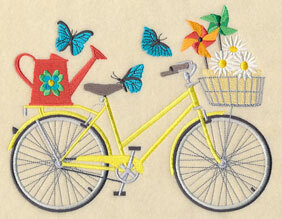 A spring-theme bike stuns on towels, wall hangings, and more. 8.43" x 6.05" and 7.77" x 5.57"
8.39" x 5.90" and 7.81" x 5.49"
7.03" x 4.94" and 5.98" x 4.21"
Any gardener will delight in an apron or tote bag embroidered with a watering can and butterflies; stitch summer wishes on with a picnic bike. 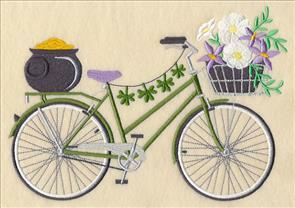 The eye-catching bicycles are the perfect way to stitch for all the seasons. 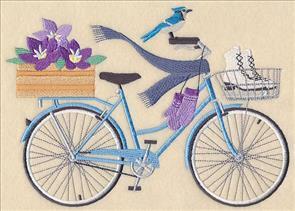 All them all to a quilt, or series of framed pieces! 8.45" x 6.64" and 7.78" x 6.12"
8.45" x 6.34" and 7.78" x 5.84"
7.00" x 5.26" and 5.97" x 4.48"
No trip to the beach is complete without flip-flops and a beach ball. 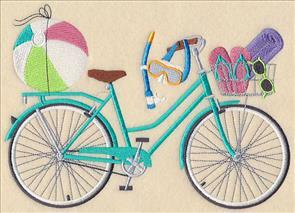 Great for towels, beach bags, and more! 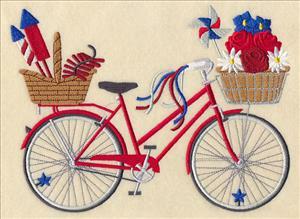 Plus, a patriotic bicycle is the perfect addition to any 4th of July parade. 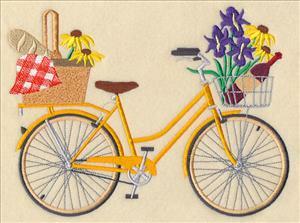 8.48" x 6.08" and 7.81" x 5.61"
8.47" x 6.31" and 7.80" x 5.81"
7.02" x 5.23" and 5.98" x 4.45"
Beautiful sunflowers and a market tote filled with goodies give this bicycle a summery style. 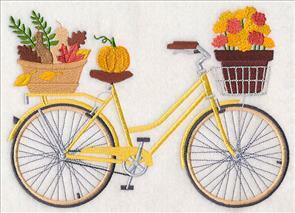 As the seasons change, switch your projects out for a version featuring a basket of apples and autumn leaves. 8.45" x 6.03" and 7.78" x 5.55"
8.48" x 6.27" and 7.81" x 5.78"
7.03" x 5.20" and 6.00" x 4.44"
A too-cute-too-spook cycle will wish any trick-or-treater a "Happy Halloween!" 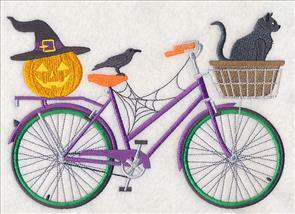 Adorn towels, placemats, and welcome flags with a fall-theme variation. 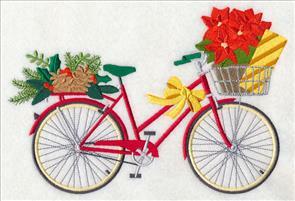 8.45" x 6.02" and 7.78" x 5.54"
8.40" x 6.03" and 7.74" x 5.56"
6.97" x 5.00" and 5.95" x 4.27"
Poinsettias, holiday gifts, and festive foliage give this bike a traditional Christmas appeal. 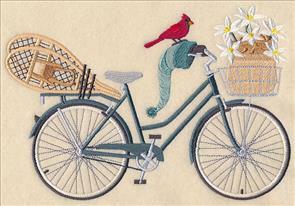 Or, stitch for the frosty flurry of winter with a bicycle carrying snowshoes, a cardinal, and a cozy wool hat. 8.45" x 5.72" and 7.79" x 5.27"
8.49" x 5.86" and 7.81" x 5.39"
7.03" x 4.85" and 5.99" x 4.13"
Purchase these brilliant bicycle designs individually by clicking the links above, or get all 20 of the designs in a pack.